Longer than two football fields and 80 feet wide, a large steel paper rack storage facility was constructed with 110 foot tall hollow steel columns to hold over 100 million pounds of pallets of paper products. After two months in service, the automated facility collapsed and sparked a fire that burned over three weeks. We were asked to perform a forensic investigation of the collapse. Non-destructive evaluations including visual, ultrasonic (UT) and radiographic techniques were used to assess the condition of the structural square tubes and to assist in the selection of specimens for defect evaluation. All of the damaged tubes submitted for evaluation exhibited extensive linear weld seam tears in deformed regions. 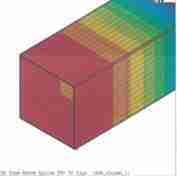 We also performed finite element analysis on individual beams, as well as a segment of the entire rack structure. The failure mode was determined to be flexural torsional buckling of the 4″ x 4″ welded steel columns. The result of the litigation was in favor of our client. Read about it here.